Bluehost Hosting Review  - For small business, Is it good or bad? Bluehost Hosting Review – For small business, Is it good or bad? Choosing the best web hosting for a small business website is one of the most important steps you’ll need to consider to get off on the right foot. Our themes are app themes so they will run much faster on a host which values speed for its customers. We also consider value for money whenever we recommend any best WordPress hosting company to our valued customers. These are the services vital for the smooth and efficient functioning of your website, at an affordable fee. BlueHost hosting is one of the hosting providers that provides all these features. It is primarily popular for its shared hosting and has all the services aimed at strengthening and supporting your business website. Out of all the types of hosting, shared hosting is the most popular as well as the cheapest. The other alternatives are VPN and dedicated hosting. But “Shared hosting” is a clever choice for your small business website if you choose the service provider carefully. VPN and Dedicated hosting are preferable when the number of visitors on your website is expected to be significantly large. As far as medium to small businesses are concerned, their scope is limited and therefore the number of expected visitors is less – so shared hosting fits perfectly. 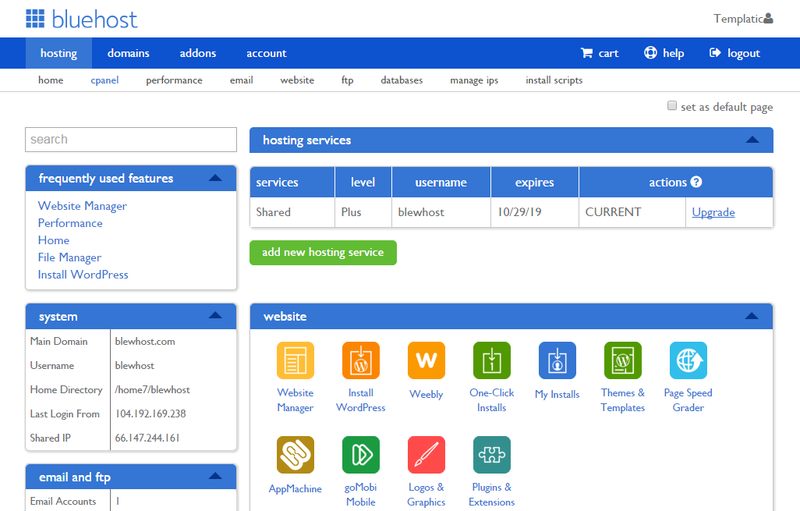 In this review of BlueHost hosting started off with their shared-hosting service and it is one of the best they offer. Back then, there were limited plans and features. Gradually, the services evolved and now what we have is an enhanced service that is tried, tested and modified over time. The plans are adequate and affordable. And security is something that BlueHost assures you of. The initial plan of BlueHost is offered at just $2.95 per month. And the best thing about this plan is that it includes everything that you need for hosting your website online. However, if you ever wish to elevate to some other service, at any moment of your service period, you can do this easily. We will get back to the migration services later in this article. The company was founded in 1996, by Matt Heaton, who had this idea to provide an efficient web hosting service. Bluehost happens to be a persistent web hosting solution since then. Matt Heaton served as the CEO from 2003 to 2011. Dan Handy was the next CEO who operated from 2011 to 2015. The company was acquired by Endurance International Group. The current CEO is Mike Oslon, appointed by EIG. BlueHost has been around since long. It has provided its service to a large number of people since decades. Today, BlueHost hosting empowers more than 2 million websites. Large and small businesses trust it for hosting their websites. If you are in a hurry, here are the BlueHost features for small business! Review – Best Web Hosting for WordPress? Creating and maintaining websites is now no longer a domain restricted to technical persons with the knowledge of computer programming. Thanks to the CMS and the various Website building tools, WordPress is definitely one of the best among them. However, WordPress isn’t self-hosted. So, if you are about to create your business website using WordPress, hosting is still a question. BlueHost is emphatically recommended by WordPress.org and is an excellent provider of shared hosting. It tops the list of the best hosting recommendations by the official WordPress.org blog. 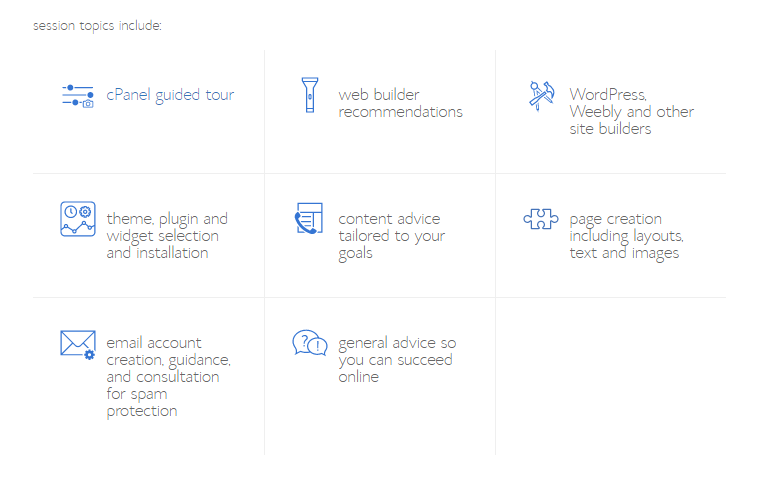 For the non-techies who want to use WordPress to create their website, BlueHost offers a special feature called the “WordPress 1 click install”. And it does exactly what it says, lets you install WordPress in seconds. This makes it possible to get your WordPress site running in seconds. Besides, there are also some WordPress related features and special support from WP experts that you can subscribe to. To this day, BlueHost hosts more than 1 million WordPress websites. It also has provisions for hosting WordPress with WooCommerce for eCommerce websites with secure transactions. You’ll never feel trapped with BlueHost. They have a clear and well-defined refund policy. 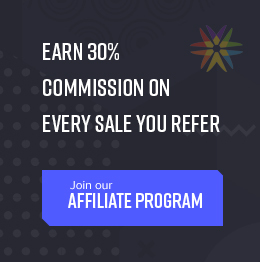 The “30 days money back guarantee” states that if you are not satisfied and want to leave BlueHost within the first 30 days of service, you will get a full refund. This essentially feels like a trial period, you only stay with them if you are satisfied, else you can claim and get your money back. However after 30 days too, you can unsubscribe anytime and get the money back for the unused period of your subscription. So basically, you are free to change your mind at any time if you are not happy with their services. However, there is no refund for the domain registration. BlueHost is one of the hosting providers with the best pricing. But this doesn’t mean that their services are compromised. The page loading speed is fairly good. This is because they manage the websites on their servers well and move the sites that need more resources to other servers so that they don’t disrupt the functioning of other websites on the same server. They have maximum uptime, which considering their low price, is impressive. Many of our customers are BlueHost users and they are quite happy with the service they are provided! When you are running a small business website and your budget is fixed, the price for hosting your website is a major concern. BlueHost is hands down one of the most affordable hosting service providers. The basic plan for shared hosting starts for just $2.95 per month which is quite economical. This plan is good for blogger, authors, etc to start their website right away. It lets you host one website through your account. The next is the plus package that charges you $5.95 per month and it removes the restriction of the number of websites you can host. This plan is ideal when you have multiple small sites to host. No restriction on bandwidth or storage, or sub domains. The Pro plan is for you when you have larger sites and more requirements, the per month cost is $12.95 and it includes a dedicated IP address, SSL certification, domain privacy and backup features. However, if yours is just a basic business website, or an online blog website, the basic and plus plans are good. The basic plan they provide, WP standard will probably fit the requirements of your small business website. If your requirements are higher than that, there are other plans too. You can choose the package you want to subscribe on the basis of your expected number of visitors, storage needs, and security requirements. They even have special provisions for hosting your WordPress eCommerce websites based on WooCommerce. Their pricing plans are quite practical and you’ll probably find the best plan as per your needs as well as best service for the price you pay. Besides there are special plans and offers for the VPS hosting as well as dedicated hosting. Even the delay of minutes (if not seconds) in online business can harm you a lot. The competition is tough and you might just miss a golden opportunity while waiting for the support representative’s email respond. You should always choose a host that provides 24X7 telephonic support and BlueHost hosting does that too. Besides, they also offer the 24X7 live chat and email support. When running business website online, there are a number of things asking for your attention. Besides, for a server related issue, you would want to resolve it as quickly as possible. In that case, you wouldn’t want to rely on email support. Sending an email and then waiting for the service provider to respond is beyond annoying when you have a critical network issue on your hand. It is really convenient to make a call and ask the question to the expert at your hosting company and get your questions answered instantly. If you are already running your website using some other host, and wish to switch your provider, these people will help you to move your website to their host. Switching host is made simple with the migration service from BlueHost. This service is quite affordable considering the bothersome task of transferring and setting up everything again. They will help you move about 5 websites and 20 email accounts. We are all full of doubts when we start something new, aren’t we? This is same when you switch your service provider or subscribe to a new service. How good it would be if we get expert’s help to get started! BlueHost provides this in form of “Quick start” service. On subscribing to this service, an expert from BlueHost will help you understand the options, answer your questions and explain the options available in your account. It basically implies that the agent will be with you for 45 minutes session where you will guide through the setup and explain the services associated with your account. The following are the topics covered under this service. This service will help you make the optimum use of the features available to you. Any business grows over time, and it demands more efforts and more resources. Same will be the case with your business website. Over time, as your business expands and its scope, services and the number of visitors increases, your server requirements changes too. At this stage, you may want to subscribe to a higher plan with more server space, features, and security. For this, BlueHost lets you gracefully upgrade your account to their other services like VPS or Dedicated hosting. You can even switch to their cloud service. And this will be done in minutes!! The latest addition to the hosting service is the cloud solution. It is faster, reliable and safer. BlueHost is an efficient provider of cloud hosting solution. 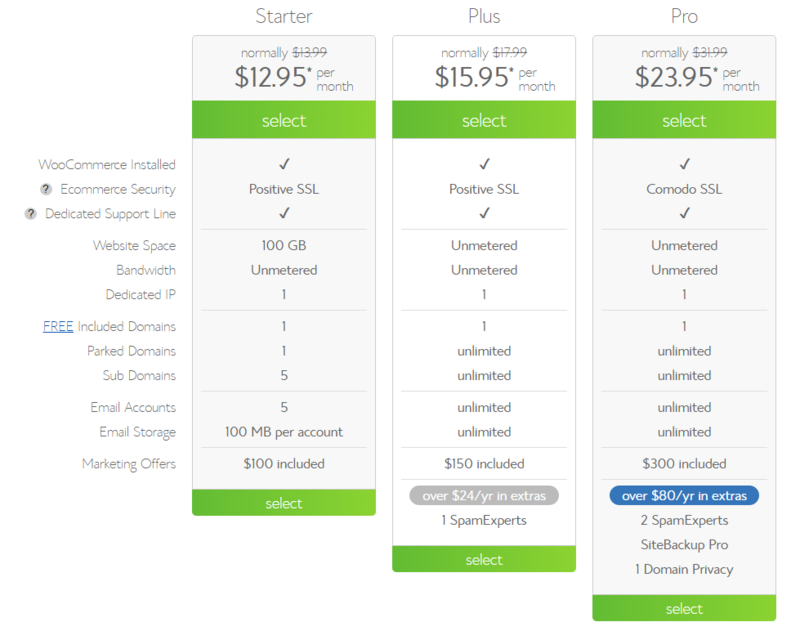 Starter – $6.05 per month where you can host one website, with 100 GB storage unlimited bandwidth, with 1 free domain. This service is considerably cheaper and good for beginners. It is best for bloggers and business website who are only concerned with showing their business details online. 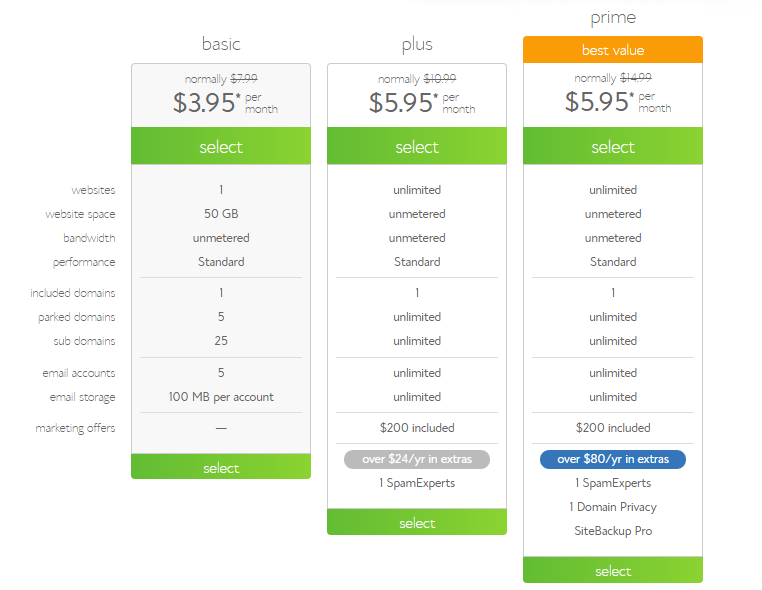 Performance – For $8.95 per month, this package lets you run multiple websites, with one free domain, unlimited storage, and bandwidth. This a moderate plan is good for practical businesses. It is the most popular plan. Business pro – $15.95 per month is the enhanced plan that has all the features of above two plans with unlimited websites, storage and bandwidth, 6 GB RAM and security features such as dedicated IP, SSL certificate, backup and restore features. It is a little costlier but is the most secure and efficient plan if you are concerned about the speed and safety of your website. You can pick up the price package that fits your requirement, for small to medium businesses, the starter and the performance plans may prove to be sufficient. BlueHost has a simple and intuitive Cpanel with visual icons and well-organized options. You can upgrade the services, subscribe to the optional services, view the performance statistics, manage your files, manage emails, etc right from the dashboard. Ready for CDN – CloudFare comes included! Tons of optional features like unique IPs, sitelock, domain privacy, SSL certification, etc. Considering the requirements of small business websites, Bluehost hosting provides everything that is needed, while maintaining the affordability. Especially, when your website is WordPress based, it has added benefits for you. Being one of the oldest hosting companies, it is reliable. It already is trusted by a large number of happy customers that keeps growing. Apart from the hosting, you can even benefit from the other services it offers. Like migration from an existing host, their prolific support, dedicated WordPress hosting etc. So if you are looking for an affordable yet feature-packed, easy to use yet a flexible hosting company, BlueHost is surely for you. Hope you loved this Bluehost hosting review.